The Caspian Sea countries present growing importance in the global energy market. The largest energy producers in the region are Azerbaijan, Kazakhstan, and Turkmenistan. In recognition of the growing importance of Caspian countries in the global energy market, this article takes a look at the internal energy markets in the region and its oil and gas supply potential. The largest energy producers in the region are Azerbaijan, Kazakhstan, and Turkmenistan. The region has significantly expanded its oil and gas exports to international markets since the beginning of the 1990s and Azerbaijan, Kazakhstan, Turkmenistan all have the potential to increase hydrocarbon production in the coming years. The increases in output so far have been associated with, and encouraged by, an emerging diversity of export routes and markets. The big question for the Caspian region countries is how to sell their oil and gas. Their large neighbor, Russia, has lots of oil and gas of its own, plus an extensive pipeline network to move that oil and gas. Russia’s Gazprom gas monopoly therefore does not need Turkmenistan’s gas for the Russian market nor for re-export from Russia. BP Statistical Review of World Energy 2001, June 2001; BP BP Statistical Review of World Energy June 2006: Energy Information Administration. Caspian Sea Region: Survey of Key Oil and Gas Statistics and Forecasts, July 2006; EIA. International Energy Outlook 2006, June 2006, [http://www.eia.doe.gov/oiaf/ieo/index.html], viewed September 7, 2006. Gotz R. (2005). Russian energy and Europe, Research unit Russia/CIS, German institute for international and security affairs. http://www.energy.cr.usgs.gov/oilgas/noga/2004update.htm], viewed March 1, 2005. Nathan J, 2008, Kazakhstan Oil Supply Chain: Despite Upstream Synergy, the Republic Faces Downstream Challenges in Global Markets, 16th Annual Convention of the Global Awareness Society International, Seoul, Korea. Sterman, J. D. (2000). Business Dynamics: Systems Thinking and Modeling for a Complex World, Irwin/McGraw-Hill. EMADI, Seyed Emad; NEZHAD, Hameed. Energy market for Caspian Sea oil and its supply. 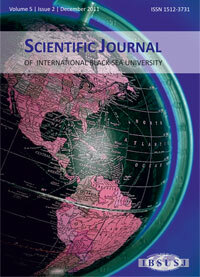 IBSU Scientific Journal, [S.l. ], v. 5, n. 2, p. 21-34, dec. 2011. ISSN 2233-3002. Available at: <https://journal.ibsu.edu.ge/index.php/ibsusj/article/view/206>. Date accessed: 23 apr. 2019.